The Race to the Brewery is run as an annual fundraiser for Relay for Life. This race has something for everyone. It is fiercely competitive for those that way inclined, yet the more social teams still love the event leaving with a huge sense of achievement and many memories from a day full of team spirit and personal challenge. Competitors woke to near perfect conditions for the 7th Race to the Brewery. Hardly any wind (which is almost unheard of in Palmy), some cloud cover to provide relief from the sun and a mild temperate day just right for the fierce competition looming. Each team (of up to 10 participants) completes 6 legs, consisting of road cycling, running, walking and mountain biking, making up a unique course of over 60km from Property Brokers, Palmerston North to the Tui Brewery in the mighty Mangatainoka. Forty-one teams were ready to take on the challenge and make the journey across land and river to the Tui Tower, including two solo’s, Shane Brown and Jason Wallace. Weeks of training had come to an end and it was time to see just who was going to take out the Race to the Brewery trophy for 2017. You could almost smell the tension in the air as the cyclists waited for the flag to drop to start the race. Madison Hartley-Brown (Forty Plus One), David Martin (MacDougalls) and Brent Bismark (Malt Wheezers) shot out to an impressive and uncatchable lead. Hartley-Brown and Martin couldn’t shake each other, coming into the transition point in a short 18 minutes after the starting gun, taking out first place. Last year’s winning team captain, Rick Cutts (Scaff2U Couch Spuds), led in a big bunch arriving in 21 minutes. Could they catch the leaders in the Gorge to defend their title and take home the trophy two years in a row? The Gorge proved to be an organiser’s nightmare this year, with a giant slip at the Ballance end making the original track impassible. A slight deviation meant a shortened course, which didn’t upset the gorge runners at all. This made for a faster race with the first runner, Chris Sanson from Lynch Mob, emerging from the bush after only 37 minutes. With a time like that, anyone unfamiliar with this leg would be mistaken in thinking that it was an easy stroll through the bush – it’s not! Just seconds later, Tom Francis (Forty Plus One) appeared, closely followed by Karl Parkins-Payne (Pahiatua Alpha Male). Were these the three podium winners to watch? Time will tell but there was no doubt that there were some serious athletes among us. Kym Skerman (Malt Wheezers) showed she could keep up with the boys, coming in fourth. She wasn’t letting a nasty fall slow her down at all, (resulting in seven stitches and a couple of weeks on crutches), showing just what she is made of - this lady is tough! What goes up must come down right? Unfortunately, not for those doing the walking leg – it is up, up and more up, corner after corner. This leg is a test of mental strength. James Faber (Lynch Mob) seemed unfazed however, achieving the fastest leg time (44 minutes) keeping his team in the lead. Sam McKay, (Property Brokers Marton) bolted up in 45 minutes, making some serious ground and taking his team from 16th place to 7th! The mountain bike leg has a reputation of claiming many bikes and memories of last years’ destruction was surely on Gareth Evans (Forty Plus One) mind as he entered the gauntlet in second place. He needn’t have worried, as 36 minutes later, bike intact, he appeared at the transition point, taking his team into first place. Time keepers had to check and recheck their times as the sixth rider came speeding down the road in a blur, with dust flying. Was it physically possible to complete this leg in 26 minutes? Apparently so if your name is Gareth Cannon, (MacDougalls). This guy is the real deal – keep an eye on him on the international stage. Sport Manawatu’s biker, Winston Briggs, had another impressive ride, 31 minutes, making up some ground for his team as did Jamie Dennis, (Opus Palmerston North, 34 minutes) who chased down and passed ten bikers. These guys must have nerves of steel, showing no fear on this challenging leg. Tane Perenara (Last but not Least) must have been going so fast that he literally flew over his handle bars. Dry, hard ground one point, Tane’s shoulder zero! Showing great character, he got back on his bike and finished the leg, slightly worse for wear, but eager to get to Brewery so he could dull the pain somewhat. The cross-country runners were warming up, eagerly awaiting their mountain biker’s arrival at the transition point. Geoff Bendall (Forty Plus One) headed out knowing full well that Lynch Mob’s, Chris Sanson (still warm from his gorge run) was on his heels and gaining ground fast. Not content with claiming the fastest time through the gorge, Sanson’s 27-minute run clocked in as the quickest in this leg too. Passing Bendall at the river crossing, with the end fast approaching, Lynch Mob had regained the lead. Meanwhile Pahiatua Alpha Male were holding their third-place spot quite comfortably, helped by Greg Archibald’s second fastest time of 33 minutes. While all this excitement was going on, Opus Palmerston North, The Beastie Boys, Humphries Construction and Team Moana were off having their own little adventure. Heading off in the wrong direction, these four were further away from the transition point than they were at the start of the leg – they were totally lost. Hey, they say if you don’t get lost once or twice then you are not having an adventure, so I guess these four have something on the rest of the field. All eventually arrived at the transition point, safe and sound, with a good story to tell over a beer at the Brewery. The final dash is a sprint to the end and this year proved to be an exciting sprint at that!! With the addition of a river crossing to contend with this year, this leg is a bit of fun. First is the uphill farm run all the way to the iconic TUIWOOD sign, then down the hill to plunge into the Mangatainoka River, scrambling across the rocks to cross the finish line at the brewery. Tom Francis (Forty Plus One) watched with dismay as Lynch Mob runner, Richard Marshall, headed off through the gate in first place. With a three-minute lead, it was looking like the new-comers were going to take out the winning spot. Francis gave it everything and was gaining….but the finish line was looming, could he make his move in time? With a ‘never give up attitude’, Francis caught Marshall at the river, went lightning speed over the rocks and sprinted the final 100 meters into the Brewery to give Forty Plus One the title of Race to the Brewery Champions for 2017. What a finish! What a race! What a day! Lynch Mob gave it everything to the end, coming in second place less than a minute later, with Pahiatua Alpha Male taking out third. Last year’s champions, Scaff2U Couch Spuds had to be content with fourth this year and More FM put in their expected solid effort to be placed fifth. The atmosphere at the Brewery is always full of team spirit. Exhausted and elated, teams end the day sharing stories and reflecting on the adventures of the day. Family teams, workplace teams, teams made up of mates that get together once a year for the challenge, solo competitors, first timers and those who return every year – this event has them all. It is a great day, for a great cause and we thank everyone for making the day such a success. Solo: Shane Brown: Shane completed the entire course on his own in an impressive 3 hours 54 minutes and looked pretty comfortable about it (despite checking on numerous occasions that the nurses had a defibrillator handy). Solo: Jason Wallace wasn’t put off last year either as he returned to compete as a solo once again. He must be happy with his time – a whopping 40 minutes off last years. Norwoods Good Buggers: The Pink Ladies. This vibrant team has been a part of Race to the Brewery for many years and always have fun! Not only do they show great team spirit but they cheer the other teams on as well. Race to the Brewery just wouldn’t be the same without the pink tutus on course. Team Award: Opus Palmerston North. This team also showed the spirit of the event, encouraging all those around them. It’s teams like this that help make the day a great experience for all! 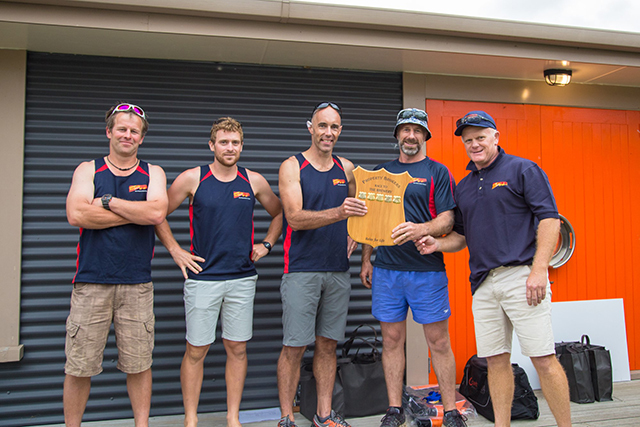 Team Award: Manawatu Toyota. Another great team to have out on the course – they come back year after year. Special mention to the final dash runner, Stephen Trail, who crossed the river, then went back again to help another team’s runner cross safely. Stephen was rewarded for his act of chivalry with a fabulous goodie bag from Gravitate 24 Fitness Center, showing that being a good guy really does pay off! View photos of the days events here. Another race over, with a new winner, for a great cause and thoroughly enjoyed by all. Bring on Race to the Brewery 2018!